Famous painting by Dutch impressionist Vincent van Gogh. Painted at Saint-Remy in 1889. Dubiously owned by Kivas Fajo 477 years later. A highly prized commodity. Requires: "Use as Equipment"-artifacts, Trading Post, Homeworld. 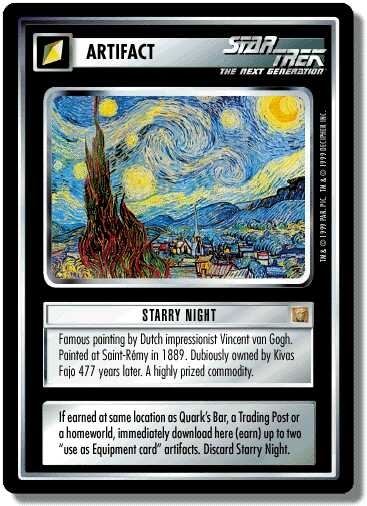 There are 53 entries for Starry Night (ST1E 8 R 3) at the Tradeplace (69 haves and 10 wants). Click here to see all trade list entries for this Rare card!